Vashon Island has many organic farms, and most of them have little farm stands set up, so you can drop by at any time and buy produce and many sell bunches of flowers. One of our very favorite to stop at is Island Meadow. Arriving late on Saturday evening means we miss out on quite a bit of the produce, as most of the growers sell at the Saturday Market on the island. When we arrived this Saturday night, there was just one lone bunch of sweet peas. But I was completely taken with the color. 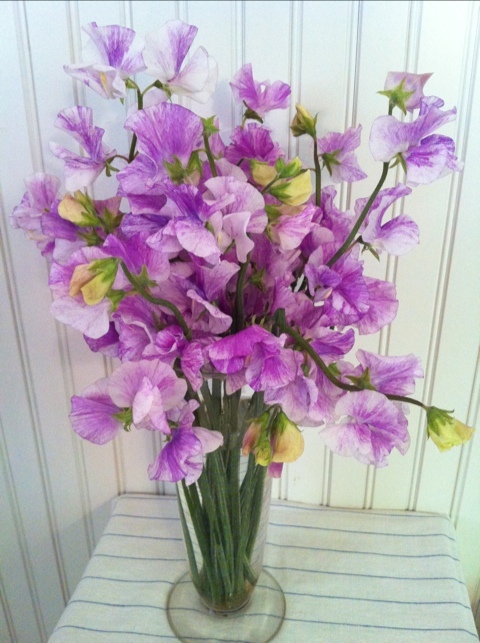 The flowers carry such an old fashioned feel to them, with their fluttering blossoms and intense scent. I knew we had just the right vintage glass beaker back at the house that would allow them to shine. 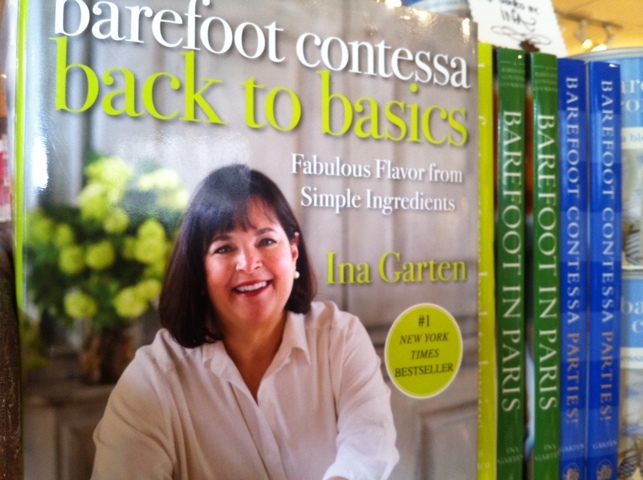 I have had the pleasure of meeting the Barefoot Contessa, Ina Garten, on several occasions. She is as delightful and easy going as she appears on her cooking show. There is something about her cooking style that reminds me of Summer. Big platters of simply prepared food, stylishly presented. Easy outdoor entertaining with your friends. The use of the best ingredients you can find, and letting those flavors be the star of the dish. 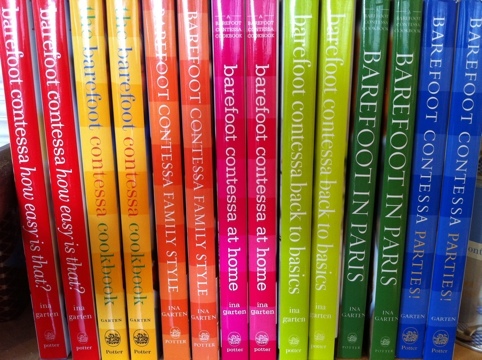 Cheers to you Ina & cheers to Summer entertaining! 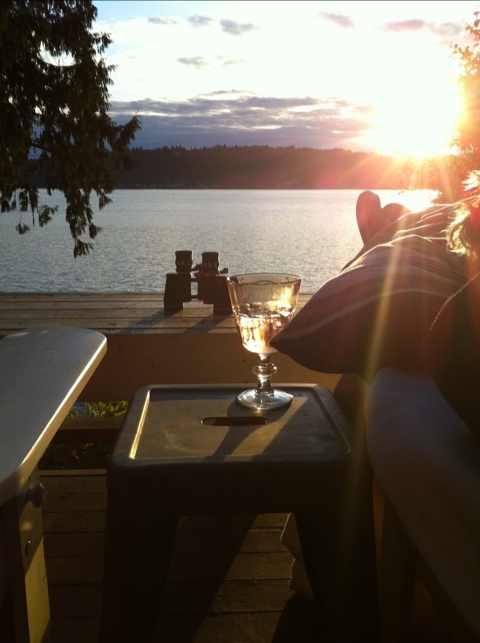 The simplest things are often times the best. 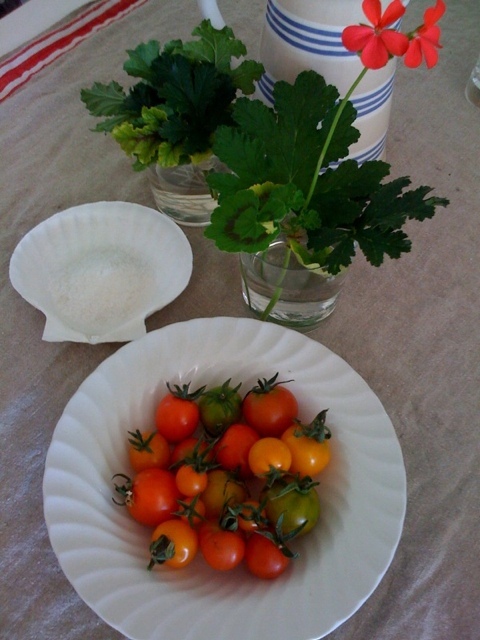 To me, a bowl of tomatoes and a dish of sea salt are the perfect combination to have with a light lunch or to serve with a cocktail before a heavy meal. This time of year, the most beautiful tomatoes will start showing up at the market and farm stands. They really can be like little works of art. They are not only yummy to eat, but I think they look amazing gracing the dining table as a visual treat, as well. We grab any chance we get to have our dinner outside. 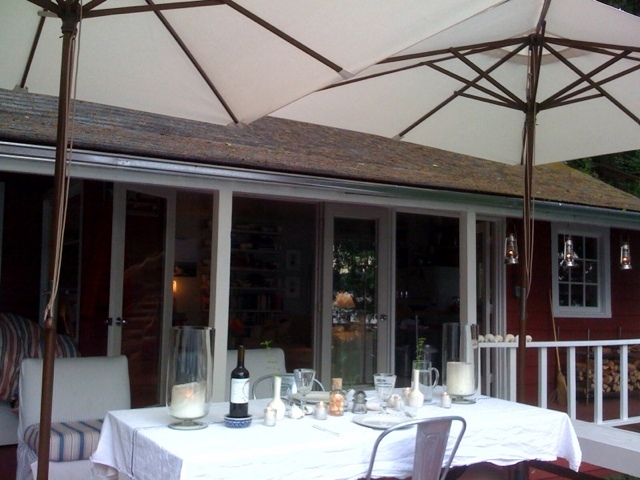 If it is the least bit sunny, out comes the zinc covered dining table onto the deck, and up come the umbrellas. I add a tablecloth and make the table setting very simple. I am a big fan of all white/cream settings with clear glassware, as it really allows the outdoor environment to take center stage. Hurricanes are also great, so even if it gets breezy, the candles will stay lit. I pull a few sprigs of herbs for single stem vases, and scatter them, along with a few “objects” which I add to any table I am putting together. In this case, an assortment of shells seemed appropriate and fit the dining by the water theme. After dinner, dessert is almost always served while we watch the sun set and settle in on the Adirondack chairs, with blankets at the ready. 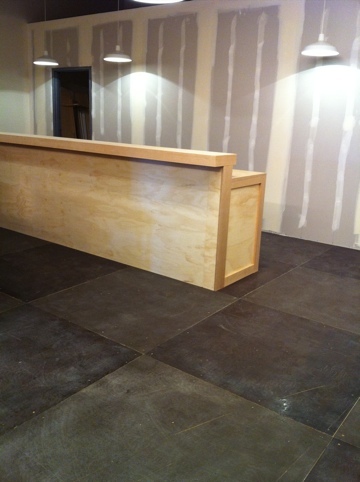 The walls are now in place, and the additional wrap stand has been built. All is going smoothly at the Fine Home expansion. 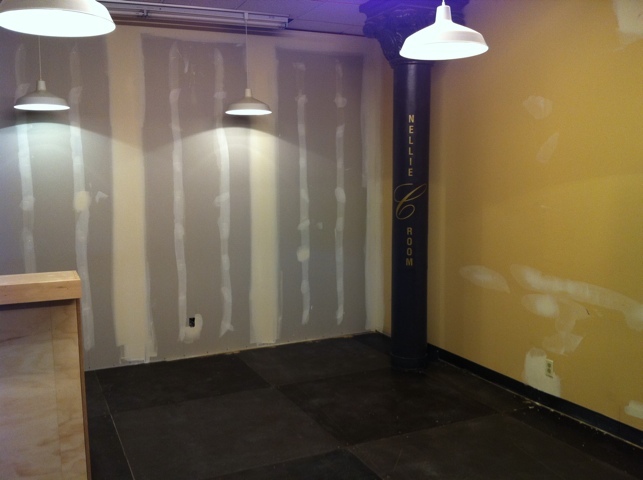 We have a temporary wall and door so the construction can take place and not interrupt business in the front of the shop. Many times a day I poke my head in, like a little kid, so excited to see the progress. The painters started painting yesterday, and that really makes it seem like there is a finish line. The goal is to have the new space done, and the temporary wall down by the middle of July. Fingers crossed! “Hi, I am Barbara Barry. Have we met before?” was the first question of the day a few weeks ago, on a Saturday morning, after I had just turned on the lights and music of my shop in the Market. I was a bit stunned, as it was still early and my coffee had not kicked in yet. Standing before me was someone I have long admired. Nope, we had not met before, but I was thrilled we were at that very moment. “Oh, you are the tulip guy!” she announced. She had seen me a bit earlier that morning walking up the hill to open my shop with an enormous bundle of field tulips in my arms, that I had just purchased from my favorite tulip vendor. She was as delightful as I ever could have imagined, and complimentary to boot. “This shop is filled with such love,” she told me. What an incredibly sweet, and right on the mark observation. Myself and all the amazing folks that work for me put a tremendous amount of love and passion into the shops each and every day. “This is one of the best stores I have ever been in. It reminds me of one of my favorite shops in Paris,” she said as she made her second spin around the space filling up her shopping basket. To get such high praise from someone who is an icon in the design world, really just makes my heart sing. 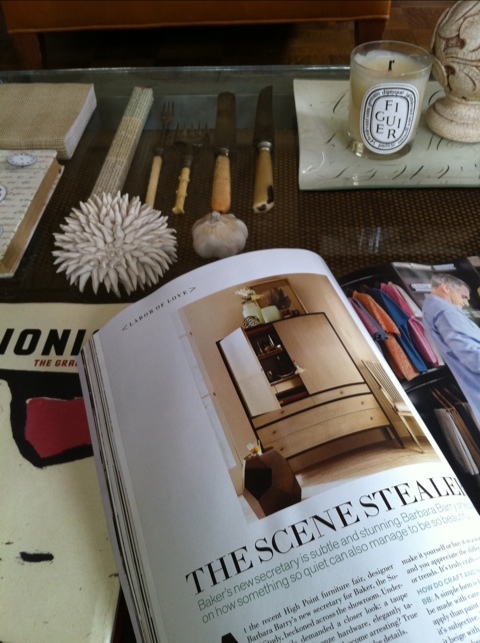 Speaking of Veranda, I think the new Editor-in-Chief, Dara Caponigro, has done a fab job freshening up the magazine. I find I now look forward to the arrival of the new issue in the mailbox, as it is more approachable, a tad hipper, and just less stiff. Cheers to you, Barbara Barry! It was such a thrill & honor to meet you. 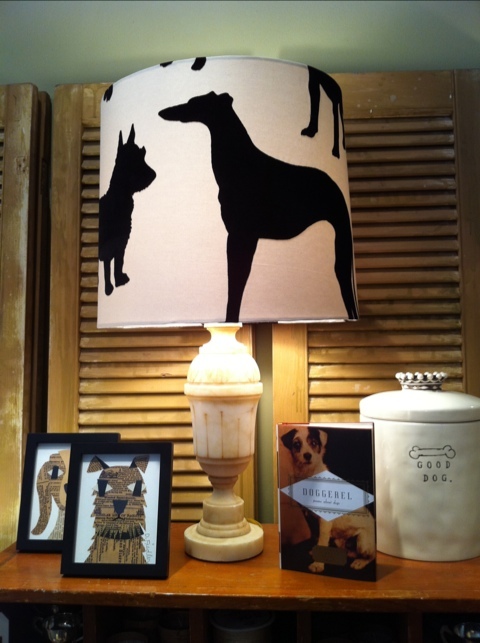 One of the great joys of being a retailer is getting in new goods to sell. Daily, we get shipments of things either vintage or new that I have found on my buying excursions. 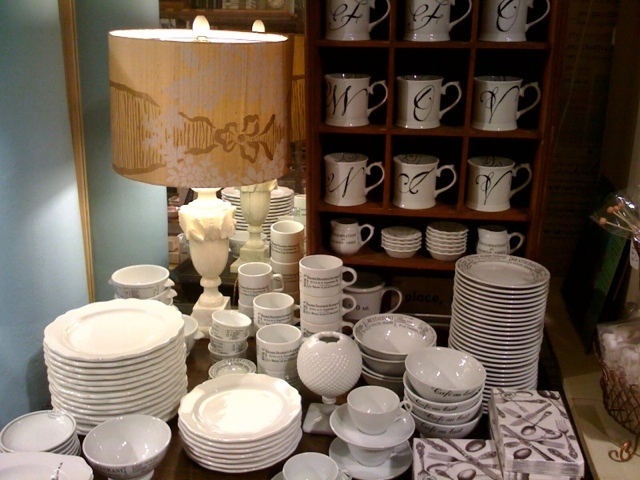 My mantra has always been that I will only buy things that I would have in my own home–that I must really love it. 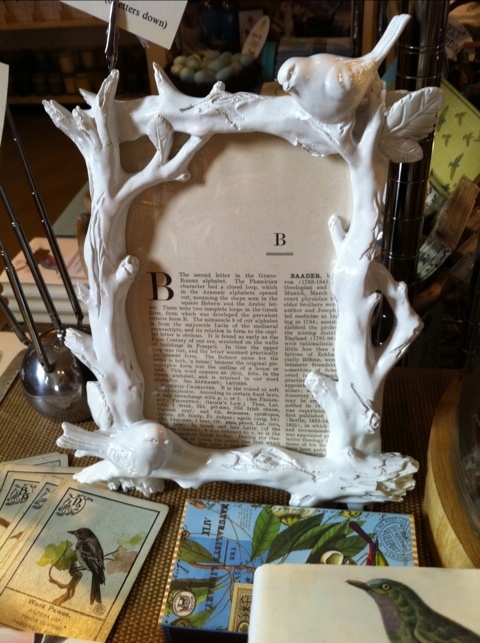 I think this high gloss white resin frame is just the perfect mix of modern, with a vintage feel. I just recently sourced these, and I am completely psyched, because I love cool push pins. 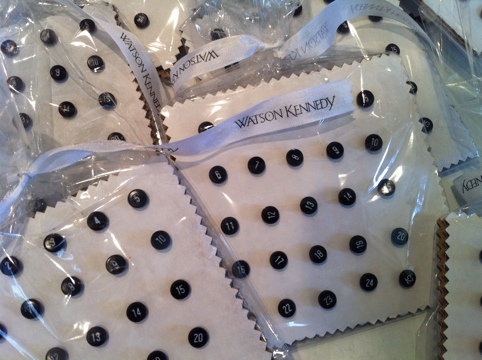 This is a set of black push pins, numbered 1 thru 25. 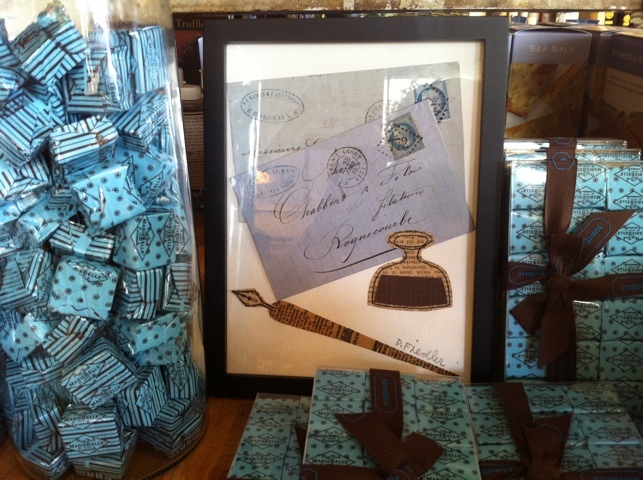 Artist Denise Fiedler finds vintage French letters and incorporates them into her artwork. 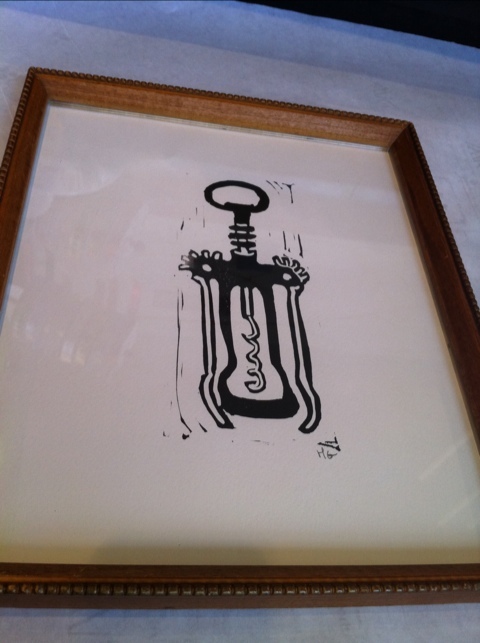 I think this corkscrew from Hugo Guinness is incredibly whimsical, which we framed in a vintage frame. I think this would be stellar propped up in a book case. 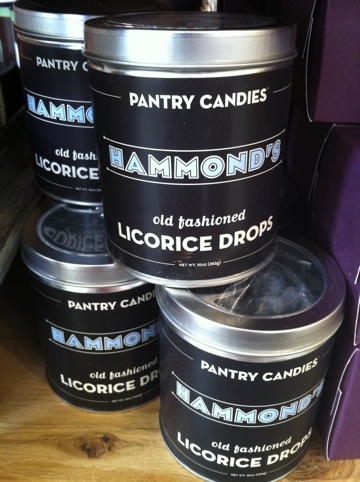 These black licorice drops are yummy, and completely remind me of my Dad, as he adored black licorice. I have a new favorite, quick and easy dessert heading into the Summer season. The sweet tart of the cherry alongside a bite of Manchego cheese is out of this world. 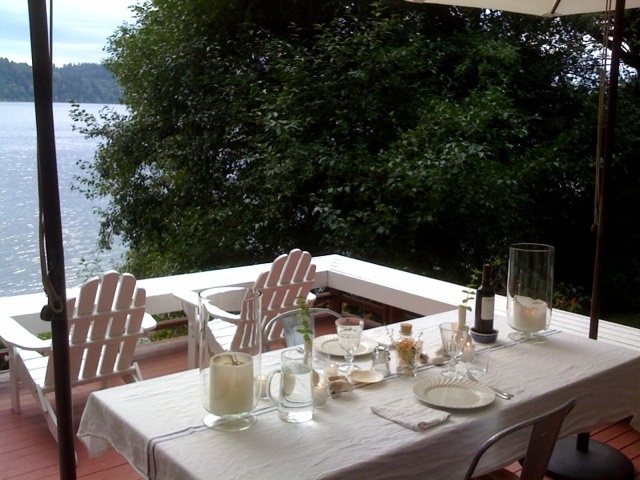 We like to host good sized groups at our beach place during the Summer months, and making a time consuming dessert after a long day of hosting is generally not in the cards. 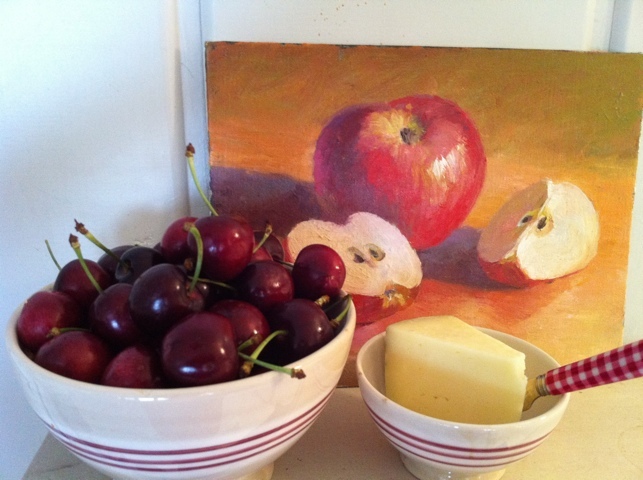 I like to fill bowls with whatever cherries look best at the market that day, and have bowls of the cheese, which is a Spanish sheep’s milk, set alongside. It is easy for guests to pass the bowls, and I like the informality of it, which is the vibe we like to set when entertaining at the beach. 2 tips. Make sure to put a small bowl out for the cherry pits, and don’t use your best white linen napkins. Use whatever napkin you don’t mind having a guest get a bit of cherry juice on. Cheers to the start of the season! 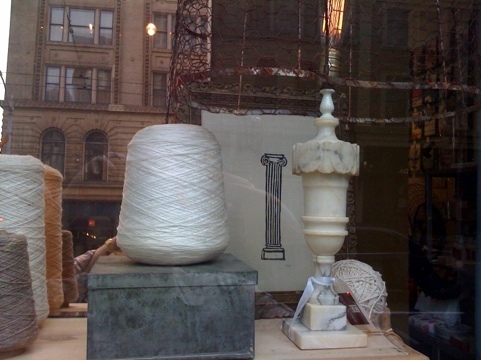 Creating a window can really be sparked by one little idea. We had just received a large shipment of lined baskets, and the minute I saw them out of the shipping boxes, I knew they would look cool stacked in the window, creating an old fashioned feel. Then I start pulling things of like color and tone. The vintage trunk was a recent find, so I knew that would be perfect. 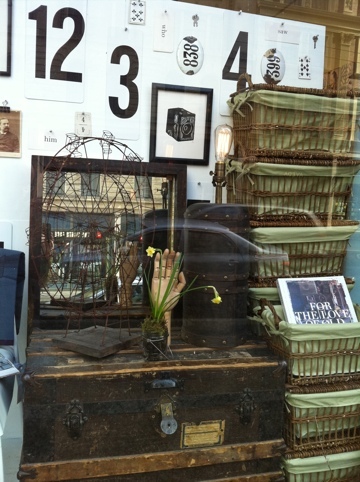 Since we have 2 large front windows, I try and have the displays be complimentary but not the same. I thought a black & white window would play well off the more earth tone sibling. 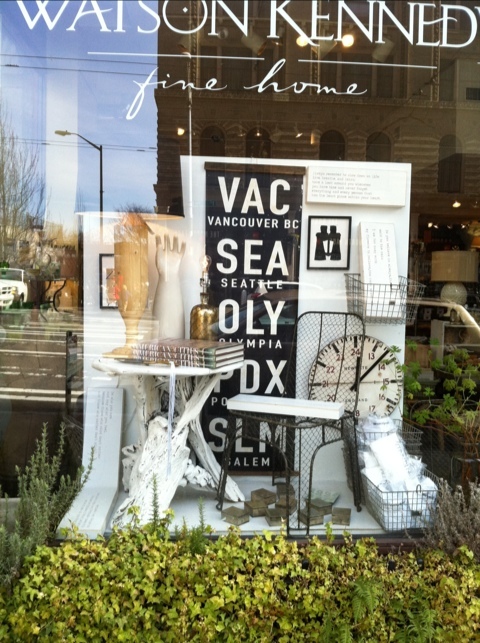 This window really came together because I wanted to highlight the large graphic destination sign, as well as the extra large vintage glove mold. After that, the rest just fell into place.